In January, I had the privilege of travelling to Houston, Texas, as a guest of the American Institute of Physics (AIP). 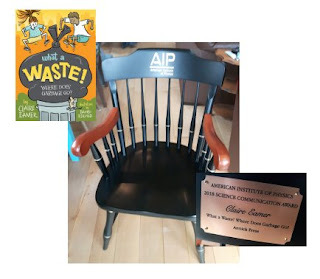 There -- at a national meeting of the American Association of Physics Teachers -- I received the AIP's 2018 Science Communication award for my book, What a Waste! Where Does Garbage Go? (Annick Press). Dave Burrell is a Grade 1 teacher at Barkers Point Elementary School in Fredericton, New Brunswick. When he read my picture book, Underneath the Sidewalk, to his class, they decided to paint their own under-the-sidewalk monsters. I think they did a wonderful job. What do you think? All the amazing art is by the Grade One students in Mr. Burrell's class. Click on the image to make it bigger. Underneath the Sidewalk, published by Scholastic Canada, has been nominated for the 2018-2019 Shining Willow award in Saskatchewan and the 2018-2019 Chocolate Lily award in British Columbia. Claire's latest kids' science book, Out of the Ice: How Climate Change is Revealing the Past, published by Kids Can Press, is now on bookstore shelves -- real and virtual. It's the story of the new science of glacial archaeology. Global warming is melting ice patches, glaciers, and permafrost around the world, revealing amazingly well-preserved reliques of the past. But the melt has a down side, even for archaeologists. Once organic artifacts and remains are thawed and exposed to the atmosphere, they deteriorate quickly. Glacial archaeology is a rescue mission, a rush to save vital information about the past before it disappears forever. 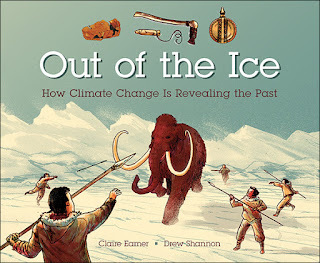 Look for Out of the Ice: How Climate Change is Revealing the Past at your local bookstore, on Amazon or Chapters Indigo or your favourite vendor. Claire is available for presentations and workshops in schools and libraries - or anywhere else kids gather. For information about presentations, check her profile at the Writers' Union of Canada website or her member page at CWILL BC. Both sites also provide general information about sources of funding for bringing authors into schools and libraries. Check with Claire (EamerWriter [at] gmail.com) for her latest rate schedule. Generally, there is a small surcharge for events beyond Vancouver Island to help cover the extra travel expenses. Claire Eamer is an award-winning author of children's nonfiction books, mainly about science and history. She also writes articles for magazines and newspapers, fiction, and even picture books. Claire's books can be purchased through most bookstores or directly from the author. Contact her at EamerWriter (at) gmail.com for a price list and order form.